Which Florida MSA Form is Right For You? It's easy to choose from the 3 Florida Marital Settlement Agreement forms that a Pro Se filer can use. Which one is right for you, simply depends on the divorce you are filing. Do you have minor or dependent children, or is the wife currently pregnant? Yes, there are minor or dependent children. 4) the wife is currently pregnant. 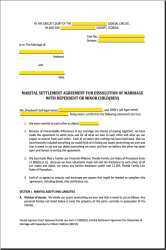 The Florida Marital Settlement Agreement for Dissolution of Marriage with Dependent or Minor Children, Form 12.902(f)(1). We've written a comprehensive step by step guide to filling out the MSA With Children form. You will also be filing this MSA form with a Dissolution of Marriage With Children. You might also be interested in our step by step instructions page for the Divorce with Children form. No, there are no minor or dependent children. If your answer is no because you have no children involved, you have two choices of the Florida Marital Settlement Agreement forms to pick from. Which one of the MSA forms is right to use depends entirely on the divorce petition you are filing. For instance, if you qualify for the Simplified Petition for Divorce, your Marital Settlement Agreement form is the MSA for Simplified Divorce. If you are filing for the Simplified Dissolution of Marriage, the correct MSA form is the Marital Settlement Agreement for Simplified Dissolution of Marriage, form 12.902(f)(3). If you meet the filing requirements for the Simplified Divorce, go ahead and download this form. See box below. Learn more about Florida's Simplified Divorce procedure and find out if you qualify with our easy instructions page. If you are filing for the Dissolution of Marriage With Property, the correct MSA form is the Marital Settlement Agreement for Dissolution of Marriage with Property but No Dependent or Minor Children, form 12.902(f)(2). Learn more about the Divorce with Property procedure with our simple do it yourself instructions page. We've written a comprehensive step by step guide to filling out the MSA With Property form. Why include a Marital Settlement Agreement with your divorce? Simply stated, filing a complete Florida Marital Settlement Agreement with your divorce petition is the key to an uncontested divorce. Every pro se filer I've met (with the exception of one, long story) is interested in the least complicated and least expensive way to a final divorce judgment. The simple act of coming together to hash out a detailed divorce agreement makes the divorce process as easy as it can get. There is just no way around it. Not coming to a complete MSA agreement, and expecting the court to decide any issues for you can make your experience regretful, to say the least. Not to mention, potentially draining your emotional reserves and your bank account at the same time. It is worth your while to make every effort to file a complete marital settlement agreement. If your situation is complicated, or if you are having a tough time coming to a mutual agreement, get legal advice first, and seriously consider using mediation. In my opinion, mediation is the best way to avoid the distress of the contested divorce trap. We recommend our free family lawyer referral service if you have legal questions and if you are considering mediation.